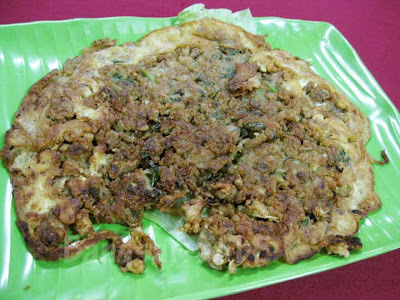 The Oh Chien (oyster omelette) was served first and it was mediocre. rif and I like the edges of the omelette to be nice and crispy, but this was floppy (not to mention oily) and the oysters were tiny. 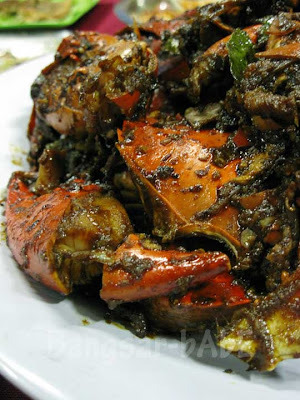 The Kam Heong crabs were too sweet and lacked the fragrant smell of curry leaves. The crabs however, were sweet and succulent. I think maybe Marmite or butter crabs would be a better choice. I found the butter Nestum prawns delicious. I especially liked the rich, buttery sweet sauce that coated the fresh prawns. Topped with crunchy nestum bits, this was scrumptious! 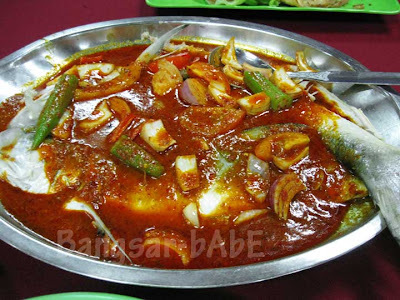 Served piping hot, the Asam Fish lacked aesthetic presentation. Luckily, it tasted better than it looked. 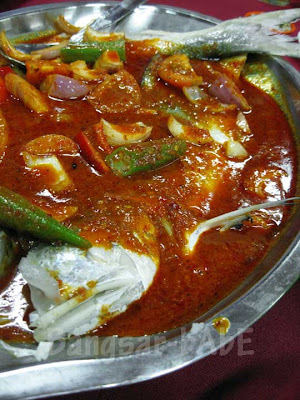 The thick gravy had a nice balance of spiciness and sourness, and the brinjal, okra and tomatoes were not mushy (I like the veges to have a bit of bite). This was good with rice. Between the two vegetable dishes, I liked the stir-fried Brussels sprouts more. The garlic slices were nice and crunchy, and the gravy was light and fragrant with the addition of rice wine. Simple and nice. 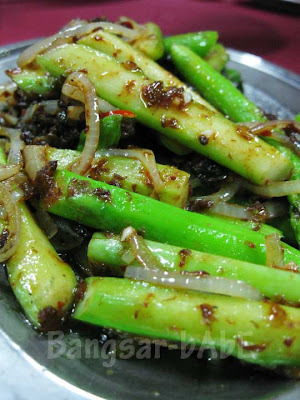 I thought the asparagus with sambal belacan was just alright. It was neither spicy nor fragrant enough, but still palatable in my books. Dinner cost about RM161 for the 6 of us, which worked out to about RM27 per person. I reckon Coconut Flower is cheaper and the food tastes better. While the food wasn’t spectacular, the company was enjoyable. Thanks for the invite babes, I had fun! 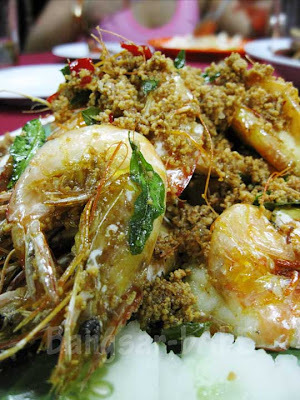 Verdict: The other dishes were forgetable, but the butter prawns and asam fish were good. 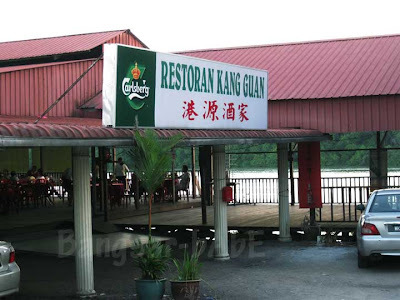 * To get to Kang Guan, take the KESAS highway towards Klang, and turn left at the exit towards Banting . After Teluk Panglima Garang, go towards Banting and there will be a signboard that says Pulau Carey. Turn right after you turn into the main intersection. Didn't know about Carey Island until I read your post (Shame on me). Their seafood seems fresh and good. But if Coconut Flower is better, don't think I'll go all the way to Kang Guan then. too bad…not everything were good..i've been to carey island twice…but it was long back…i remembered those days the one my aunt brought me to were good! Thanks again for sharing b-babe! so, carey island must be a lil over-rated hor? coz like evo, i also think coconut flower is a bit of a tourist trap. The crabs looked good. So if this place is over-rated, there're other better seafood places in Port Klang & Teluk Gong, i think! Coconut Flower is now a HUGE place and they seem to dominate the T.Gong vicinity. I haven't been there as the driving put me off. The fresh prawns will always be a winner. Unka – Hahaha…alright. Thanks for the rec! SimpleGirl – I guess it's individual preference…or maybe we ordered the not so good dishes. Sugar Bean – The seafood was fresh, but I think Coconut Flower is still better. 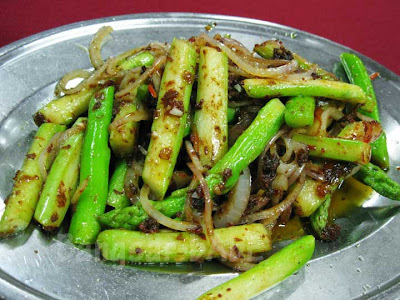 You can try Kang Guan, who knows…you MIGHT like it better than I do! Carey Island… rememeber passing by the junction everytime I went to Banting a few years ago. The road was like s**t (pardon my language) then… too many lorries and only one lane, making it a slow and dangerous stretch. 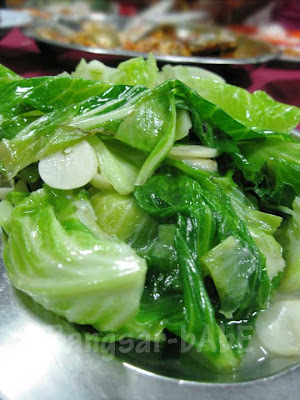 Brussel Sprout.. a dish that I ate most of the times while in NZ (very cheap) until I developed phobia… hahaha!!! 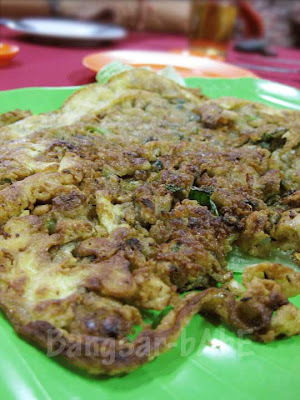 It's somewhere in Klang…but hor…how to go you must ask rif. I'm like a blind bat! leo – I agree…the journey there was crappy…so many potholes! hey, how r u doing? I'll wait for your post on it ya! A shop just outside my house @ sri kembangan does dai chow, but handles crabs n prawns very well. Other than that i normally go to pantai / unique seafood for my seafood capers hehe. EVo – I heard there are plenty of good tai chows in S.Kembangan. I've only tried two…looks like I have to explore… 😉 Unique seafood is nice…but very expensive la!! 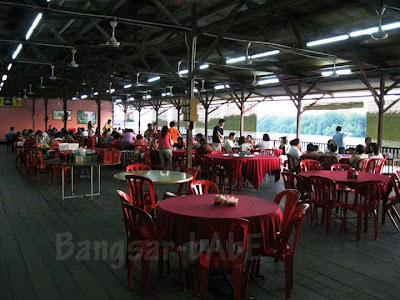 Bangsar-babe, i was also at Kang Guan just a few days ago… for the 1st time… didn't expect a good sea-food restaurant in the middle of no-where.. I also noticed a lot of corporate people eating there … only regret i did not bring along my camera… good food and scenery..